Artist: Destiny's Child Release Date: 2000 Format: CD Record Label: Columbia (USA) Genre: R B UPC: 098707944628 Sub-Genre: Mainstream Album Type: Single, EP Track listing 1. Jumpin', Jumpin' - (album version) 2. 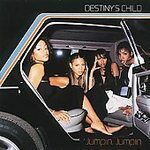 Jumpin', Jumpin' - (So So Def remix, featuring Jermaine Dupri/Da Brat/Bow Wow) 3. Jumpin', Jumpin' - (Maurice's Jumpin' Retro mix) 4. Jumpin', Jumpin' - (Azza's remix) 5. Upside Down Details Contributing artists: Bow Wow, Da Brat, Jermaine Dupri Distributor: Sony Music Distribution Recording type: Studio Recording mode: Stereo SPAR Code: n/a Portions of this page Copyright 1948 - 2008 Muze Inc. All rights reserved. THIS CD IS FROM ARE JUKEBOX COMPANY IT WAS NEVER PLAYED.